1. In your food processor, pulse walnuts and oats until they’re finely chopped. Pour into a bowl and set aside. 2. Add the dates, coconut oil, sea salt and process on high until a smooth paste forms. Halfway through processing the mixture will form into a ball, continue processing until the mixture loses its shape and becomes sticky enough to stick to the sides of your processor. 3. Add the cocoa, walnuts, + oats, chocolate chips, and crushed candy cane. Process until thoroughly mixed. 4. Line a loaf pan with parchment paper or plastic wrap. Press the brownie layer firmly into the loaf pan. Use a pancake flipper or spatula to evenly flatten the layer. Place in the freezer while you make the ganache. 1. You’ll need a double boiler for this step. Find a small metal mixing bowl and saucepan that will fit together nicely (bowl inside saucepan.) Fill the saucepan ⅓-1/2 full with hot water (keep the water level low enough to place the bowl inside without it touching the water.) Bring the water to a boil over high heat and place the bowl on top. 2. Add the coconut milk + mint extract to the bowl. Heat until the mixture is hot but not boiling. Add the chocolate chips and whisk until they’re fully melted. Pour the mixture over the brownie layer and chill in the freezer. 3. 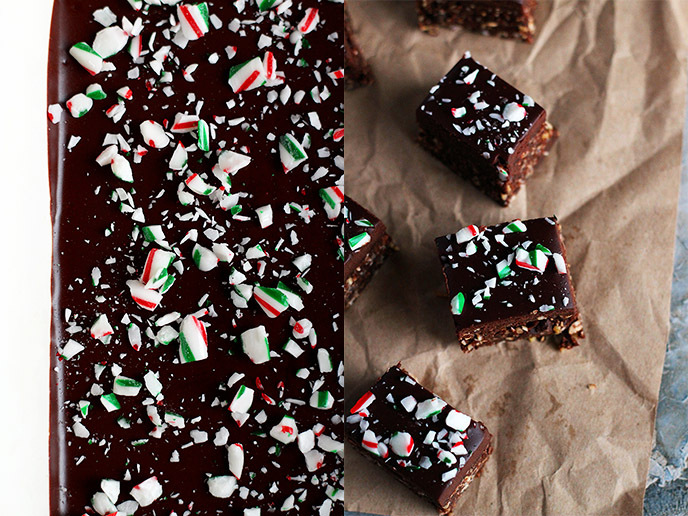 Chill for 15-25 minutes and top with crushed candy canes. Chill for another 30 minutes before cutting into squares. Store in fridge or freezer. Serve chilled. The amount of peppermint extract can be increased if you like a stronger minty flavor. Make sure to taste the ganache before pouring it over the brownies so you can decided whether or not to add more. The candy canes will enhance the mint flavor. Fold the candy canes in a piece of parchment paper and use the side of a large chef’s knife to crush them. This much easier than using saran wrap or aluminum foil. Something to keep in mind if you’re planning to serve them for parties or gift giving: If you make these ahead of time the candy cane topping will start to soften in the fridge. This doesn’t affect the flavor but they won’t look quite as pretty.